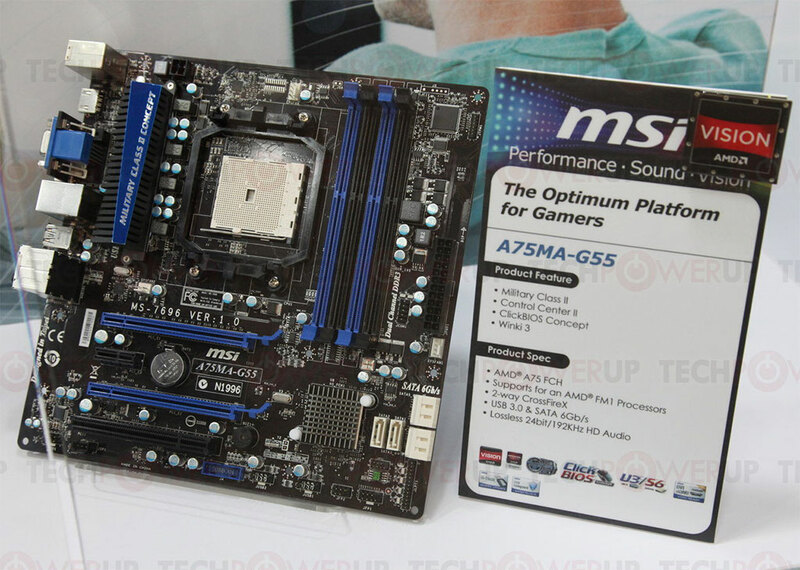 MSI displayed two new Socket FM1 based motherboards featuring the AMD A75 chipset for Llano Fusion A-Series APU’s (Accelerated Processing Units) support. 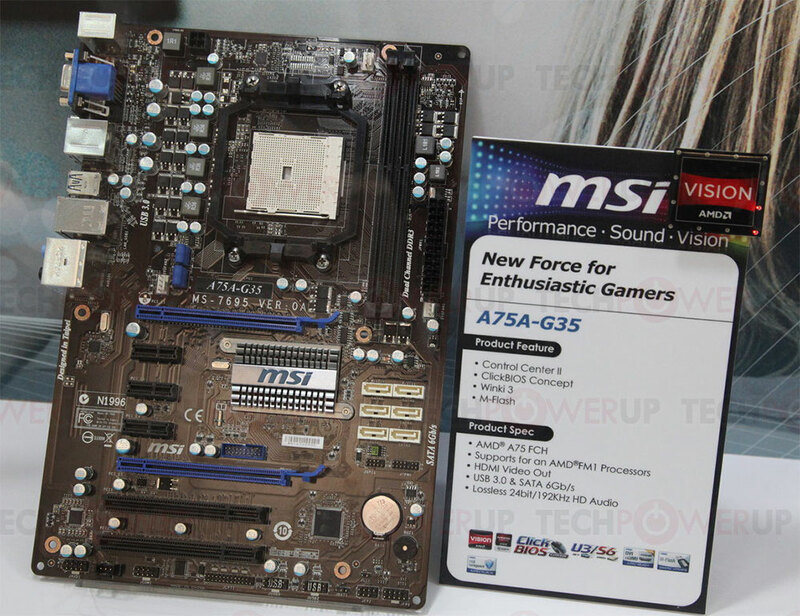 The boards included an ATX sized MSI A75A-G35 and a Micro-ATX A75MA-G55 motherboard. The MSI A75A-G35 is powered by a 3+1 Phase VRM design and includes Two DDR3 memory slots for Dual channel memory configurations with speeds upto 1600mhz. The board features 2 PCI-e slots (1 x16, 1 x4), Three PCI-e x1 and two simple PCI slots. A total of 6 SATA 6Gbps ports are located on the board while the I/O backpanel consists of 8-channel HD audio, gigabit Ethernet, and USB 3.0 connectivity ports along with HDMI and VGA connectors to allow display from the embedded Radeon chips on the Llano Fusion APU. It also includes MSI’s exclusive UEFI and ClickBIOS GUI-driven setup program to provide an easier user environment. MSI A75MA-G55 includes better features such as a 4 Phase VRM design making use of Military Class 2 II components which includes balances solid-state chokes with regular solid capacitors and the use of heatsinks to cool down the PWM area. Expansion slots include 2 PCI-e slots (1 x16, 1 x4), Single PCI-e x1 and PCI Conventional slot. This board includes 4 DDR3 memory slots for Dual channel memory configurations with same frequency of 1600mhz. 6 SATA 6Gbps ports allow storage options while the I/O back panel includes 8-channel HD audio, USB 3.0, display connectivity including DVI, D-Sub, and HDMI, gigabit Ethernet, and a number of USB 2.0 ports. This board again uses the same MSI features such as EFI and ClickBIOS GUI-driven setup. More info on the boards here. Resident Evil 7 On AMD A10 APU Only?